Sharp RAM Memory cards fit a number of their calculators. The initial series were full-size (CE-201M, CE-202M, CE-203M). Sharp then came out with the half-size series (CE-210, CE-211, ...) which were electrically equivalent but half the width. They also added some smaller and larger memory sizes in this second series of cards. While installed in a calculator, the card uses the calculator's power supply and the backup battery is not used. The life of the backup battery is 5 years or more if the card remains in a calculator with useable batteries. Calculators Designed for many Sharp pocket computers. Not all calculators can use the larger size cards. Uses system batteries for power while installed in a calculator. 1 x CR-1616 Lithium battery for backup when not in a calculator. 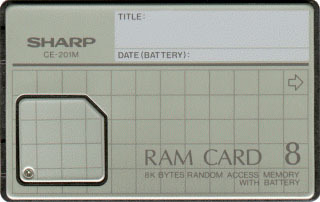 Transfer of Programs Programs stored on RAM cards that are not password protected can be transferred to a standard cassette player using the provided cassette connecting cable. Programs can be transferred from one calculator to another compatible calculator with the EA-129C Interconnecting Cable provided the program is not password protected.